404 р. Average price online * 404 p.
Naftifine is known as a high-quality antifungal drug with a broad spectrum of action and with minimal side effects. Nail fungus: The affected part of the nail is cut with scissors and treated with a nail file. 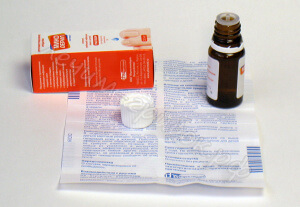 The drug is applied 2 times a day, so that it covers the affected area and 1 cm around. Duration of the course - until a healthy nail grows. More precisely, when you are sure that brittleness has disappeared, your nails have acquired a natural color and there is no nodule - apply the drug for another 2 weeks to guarantee healing and prevent recurrence. Skin mycoses: wash the affected area well and dry before applying the drug. Apply 1 time per day, capturing the affected areas and the area of ​​about 1 cm around them. The usual duration of treatment is 2-4 weeks, maximum 8 weeks. After the symptoms have disappeared, it is necessary to apply the drug for another 2 weeks to prevent recurrence. Hypersensitivity to naftifine or other components of the drug. Safety during pregnancy is not determined, therefore the drug is contraindicated for pregnant and lactating mothers . In childhood use with caution and under the supervision of a physician, not enough clinical research among children. 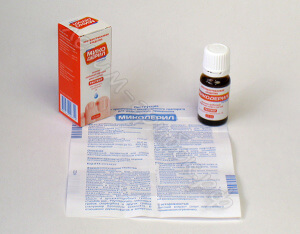 It is forbidden to apply the drug to open wounds, scratches, ulcers. Avoid eye contact. In rare cases, there may be a burning sensation, dryness, and hyperemia of the skin (redness, blood flow). Side effects do not require discontinuation of treatment and disappear after drug withdrawal. There is no data on overdose. Naftifine is a broad-spectrum antimycotic belonging to the class of allylamines. It is active against dermatophytes, yeast and yeast-like fungi, as well as mold and other fungi. When applied topically, the active substance quickly penetrates into the various layers of the skin and nails, maintaining its effect during the day. In addition, naftifine has an anti-inflammatory effect, relieves itching and has an antimicrobial effect on gram-positive and gram-negative microorganisms. It is released without a prescription. Shelf life 2 years. Store at a temperature not exceeding 25 ° C.
Tell me, how deeply to cut the nail? On the one hand, the damaged part of the nail is a peddler of the fungus and can prevent the penetration of drugs. On the other hand, cutting it all the way to the nail bed is also not the best way. It will hurt to walk and the nail may grow crooked. Fully correct to remove the nail can only a doctor. At home, it is best to cut or file off the edge of the nail as usual, as it grows. If it is already thickened, then you can lightly walk the file on the surface before each application. In order to better penetrate the drug. Do not get carried away, because the affected nail is not at all as flexible as a healthy one, and if it is thinned it can crack. A healthy nail will gradually grow, and the sick part will be cut off. You can be cured of nail fungus in a slightly painful, but effective and cheap way. At night, smear with a cotton swab itself the nail and skin surface adjacent to the nail with vinegar. If there are cracks in the skin - it will pinch. After 3-4 days, the skin in contact with vinegar will flake off and it is necessary to stop the spreading and after 4 days again anoint 2-3 times. If the nail was severely affected over the entire surface, then making these barbaric operations, the nail will grow clean. Hello! Sorry to bother you, but I was so tortured with nail treatments! I have had this dirty trick for many years - I had no money for medicines. And now neither exoderil nor varnish - nothing helps, it only increases. Have you checked the essence on yourself? And how much your nails were affected? Try this recipe: mix in equal quantities iodine and vinegar essence. Lubricate sore nails 2 times a day. I had it too. This stuff is already in the blood. Therefore, you need to drink pills. 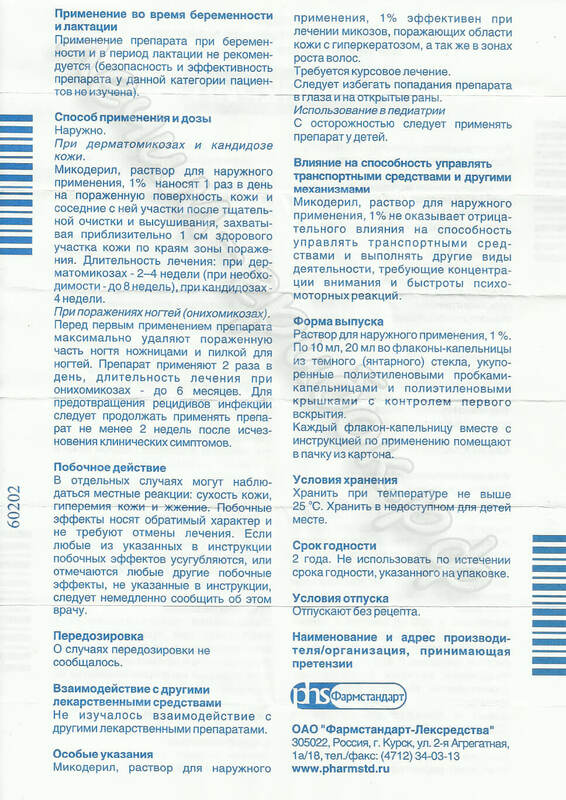 I took terbinafine (Ukraine). Saw according to the scheme 21 days, break 14, again 21. You need to keep control of the liver. Ultrasound before, maintenance therapy during the reception (thistle), ultrasound after. Everything was normal. Break half a year. Again course. Now I go for a pedicure. Once a year I spend a course of support exoderyl droplets. Now mikoderil - one bottle of 20 ml, and "specialists" give such advice that you need to work on them for a year. They make money on us. Find analogs of terbinafine, but not quite cheap, there will be no sense. Search by active ingredient. Marina, Crimea. Fluconazole in the dosage of 50, 7 tablets in a pack, 1 time a week (for example, on Mondays, as you prefer), and drip your nails or grease with a cream against fungus. 4 months and everything passes, it is checked that mom treated the fungus and now her nails are healthy. Recovery! What a Fluconazole, he's completely from another opera! Why, then, fluconazole is effective against most types of fungi that affect the nails. However, it is safer for the patient than other antifungal pills. It is necessary to accept once a week on 150 mg. In Maksavit is, in the majority of branches. Anyway, so they have stated on the site. Treat with hydrogen peroxide, steam thoroughly, cut with a file, apply a peroxide onto a small piece of cotton pad and apply adhesive tape to the damaged nail at night. yep and spit on top. And in the afternoon it is good to lubricate tea tree oil, make foot baths with the addition of apple cider vinegar and, of course, hydrogen peroxide at night. I cured so much. Tried to apply exoderil. The treatment progressed slowly. Threw. It would cost a bottle of rubles 100, then, perhaps, would complete the treatment. Rimma Balashova. We so tried to treat to mum with vinegar essence. As a result, the skin around the nail was burned in such a way that wounds were repaired for half a year. And the fungus is still there. Dima and what will be the color of the nails. Guys, I really want to help and share, no need to indulge in thoughts of a quick and very cheap way to cure nail fungus. Peroxides and vinegars will only quickly burn the skin and will not cure, as long-term treatment is required. I consider the method described below as inexpensive and very effective (I made sure myself). We must have patience. The nail of the big toe is treated the longest - the effect is observed after several months of use and is treated for up to a year (until the new nail grows back completely). 1. Cream Nogtivit strengthened (about 150 rubles) is applied with a thin layer on the affected nail overnight and covered with regular electrical tape. In the morning, remove and remove part of the nail (removed with nail clippers). Repeat several times until you remove the entire affected nail. The nail is removed very easily and painlessly! 2. 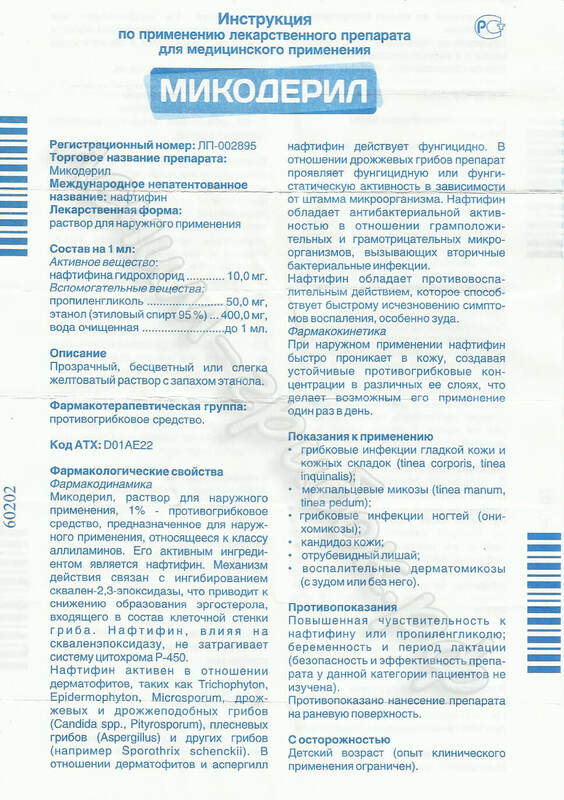 Microderil solution 20 ml (about 600 rubles) (I first used Exoderil solution 20 ml (1000 rubles more expensive), then I switched to Microderyl as it is its complete analog, also cures most known types of fungi and is cheaper). In the morning, apply a piece of a fleece on the nail and moisten with Microderil with a solution and close completely by wrapping it with electrical tape. So we go until the evening and do not remove. Enough 20 ml somewhere for a month of use. 3. Cream Undergrass (costs about 150 rubles and has antifungal effect and contributes to the earliest growth of the nail) in the evening to apply on the affected nail at night and also close the usual electrical tape. In the morning we remove, wash and repeat procedure №2. Procedure # 2 and # 3 are repeated every day until complete cure and regrowth of a new healthy nail. Ask why electrical tape? It is cheap and creates a very necessary effect of the bath, the nail and the skin around it is completely soaked with a solution from which an excellent effect is achieved. A simple application of the solution does not give such an effect, and you will spend time and money, and most likely will not have enough patience for all. If the nails are not cleaned, then no drugs will help! A little file can be cleaned off. You need to buy a manicure and pedicure el.nab. (With good power or professional, so you will continue to use foot care, you will need almost one small cone nozzle, because it is best to handle) and clean as best as possible almost grounds, it does not hurt, once a week before taking a bath, and then with medicinal preparations! That's the only way you can cure, smeared with ointment, covered with a plaster, what would be left on the nail, and not on the toes, sheets, etc. And process the shoes with vinegar essence, and tie in a plastic bag. From personal experience! If the fungus is running, then no ointments and varnishes will help. Need to drink a pill course. I had this problem for decades. I could not wear open shoes, I was ashamed to unload it, even in the summer I had to wear socks or “socks”. I read a lot of information on the Internet, tried everything. Nevertheless, I managed to find a reliable, cheap way. Thanks, I don’t even remember whom. I need to drink fluconazole tablets. It’s a cheap drug, it’s drunk once a week. infected socks and tights, treated shoes mikostopom. But you still need prevention. You need to constantly monitor the condition of the nails, because the infection may remain somewhere. My mother was treated with Fluconazole for a year and a half, zero sense. I have exactly the problem. Even shoes do not buy open. Exoderil does not help and is expensive. Now I will definitely try this method with pills and microderyl. Thanks for the advice. You can painlessly cure your nails with Orungal pills. Apply according to the scheme. But it is not cheap, but effective. Thanks to everyone who took the time and left a comment about the result of the treatment and the name of the drugs. Fluconazole 1 capsule once a week, systemically on the same day of the week, within 6 months and everything will pass, checked !!! Its price is 25-40 rubles. It is treated in 2 courses. 1. capsules Irunin, 2 capsules, 2 times a day (four days course). From the first day of treatment, 3–2 times a day we treat our feet, nails (after rinsing we rinse our feet in potassium permanganate, (do not forget to wash the bath with a cleaning agent, otherwise the treatment is useless), wipe your feet with paper towels. Apply liquid micoderil on nails, around nails mikoderil cream. Nails are further varnished with Batrafen (1 time in 2 weeks varnish). We process shoes every evening with mikostop. We wash socks daily, we heat with iron. After a month after 4 days of taking Irunin, we repeat Irunin's course 2 capsules 2 times a day. All the rest is done by the pic oyanno - lacquer, liquid mikoderil cream mikoderil, potassium permanganate, wash tubs comet or Domestos, calcination socks, shoes obezorazhivanie 4 -. 5 months before the date when fully grown healthy nails guaranteed treatment.. I was treated both by Irunin and Orungal, and now more than a year, by Micoderil, fluconazole has been drinking for over a year, everything is not effective! So much money has been spent! And I tested the fungus and determined the type of fungus, and that was all! I have quite a long time the skin on the fingertips near the nails is dry, cracks and peels off. And in recent days I noticed that the surface of the nail has become less smooth. If you look at the light, you can see the longitudinal stripes that are noticeable even to the touch. What could it be? And what to do in this case? How to get rid of it? Maybe this is a fungus? Help me please. This is because it is a third of alcohol. You did not think that it is possible to cure a nail from a fungus in a month? It is necessary to smear until the new one grows. And if this is, for example, a big toe, then it is fully updated only for a year and a half. Flucanosol tablets are useless to drink, as they only kill the yeast-like fungus Candida, and a red trihofiton causes damage to the nail plate. Fluonazole, too, was drunk off, only the liver was planted. With all due respect, fluconazole is usually effective against trichophyton; there may simply be a variety insensitive to it. Here, as with other drugs, if there is no improvement, another drug must be selected. That is why self-medication is dangerous. Microderil for nails is not very convenient to use, the instructions do not show how to drip from the side, on top everything is flowing in general production Russia. Everything as always done through ... ..
last year she treated toenails with Exoderil. The course required 30 + 20 ml. The result was obvious. Over the summer, either something lurked in the dacha shoe, or it was sorry for another 10 ml of exoderil: in short, the fungus was back. Now 30 ml of mycoderil ends, but the result is not at all happy. Certainly, there are changes to the positive side, but it grows very slowly and it’s not at all an ideal nail plate (it seems to be good in color, but somehow rough in the relief) it may make sense to return to exoderil, because there is no sense in spending small money for a small result. If anyone has encountered such a dilemma, respond!